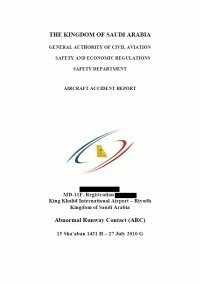 The Saudi Arabian General Authority of Civil Aviation (GACA) has released the final report of their investigation into the July 2010 landing accident involving an MD-11F at Riyadh. The report concludes that the flight crew responded to bounces on landing by using exaggerated control inputs. On July 27, 2010 a Lufthansa Cargo MD-11F cargo plane departed Frankfurt (FRA), Germany on a scheduled flight to Riyadh (RUH), Saudi Arabia. There were two crew members on board. The first officer was the pilot flying. The flight was radar vectored to the instrument landing system of runway 33L at Riyadh, and the first officer flew the approach with a planned Vref of 158 knots. Convective conditions prevailed, with a temperature of 39°C and winds at 15 to 25 knots on a heading closely aligned with the landing runway. The flare was initiated by the first officer between 1.7 and 2.0 sec. before touchdown, that is: 23 to 31 feet above the runway. The main gear touchdown took place at 945 ft from the runway threshold at a descent rate of -13 ft/sec. (780 ft/min) resulting in a normal load factor of 2.1g. The aircraft bounced with the main gear reaching a maximum height of 4ft above the runway with the spoilers deployed to 30 degrees following main-wheel spin up. During this bounce, the Captain who was the Pilot Monitoring (PM) pushed on the control column resulting in an unloading of the aircraft. The aircraft touched down a second time in a flat pitch attitude with both the main gear and nose gear contacting the runway, at a descent rate of -11 ft/sec. (660 ft/min), achieving a load factor of 3.0g. Prior to the third and final touchdown, both pilots pulled back on the control column at slightly different times. Although the elevators responded accordingly and started to reduce the nose-down pitch rate, the aircraft was still pitching down at the third touchdown. During this third touchdown, the aircraft contacted the runway at a descent rate of -17 ft/sec (1020 ft/min), thus achieving a load factor of 4.4g. At this point, the aft fuselage ruptured behind the wing trailing edge. A fire ignited and travelled to the upper cargo area. The aircraft departed the runway, the nose gear collapsed and the aircraft came to a full stop 8800 ft from the threshold of the runway and 300 ft left from the runway centerline. The fuel to the engines was cut off and both pilots evacuated the aircraft by using the slide at the Left One (L1) door.